Watch and learn how Lucas Mahlangu takes his castles from the sky on to Durban’s golden shores. The road from Mpumalanga to Durban was long and bumpy. The family was beginning to grow weary. Turning to his tiny daughters, Lucas Mahlangu winked reassuringly. He had a plan – to get to the coast and make a better life for his family. But at the journey’s end, Mahlangu was met by the dismal truth. Work in the big city was tough to come by. Stumped, he did what Durbanites do. He went to the beach. There, Mahlangu watched children heap sand into little plastic buckets while adults drew detailed portraits on the ground. “I became so inspired,” he says. That’s the moment Mahlangu decided to take fate into his own hands. 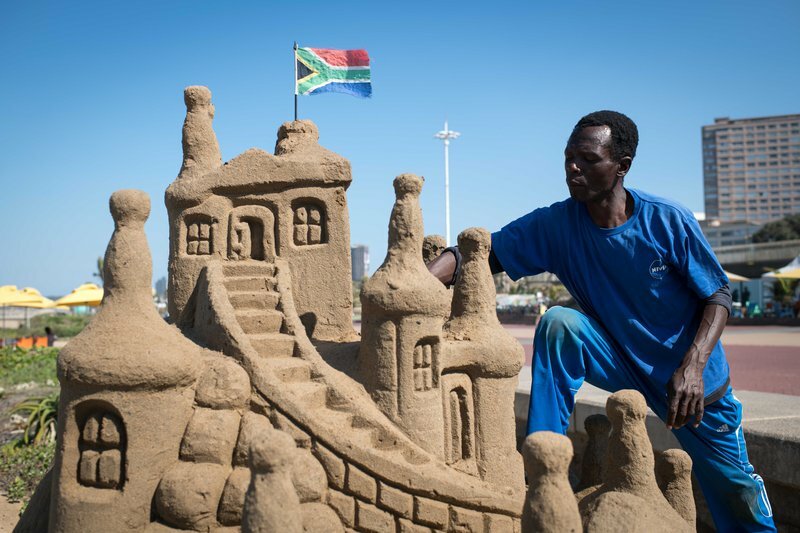 Mixing imagination with his will to survive, he ventured into the world of sand sculpture.